For those of us who work in tight quarters, which certainly includes me, it’s always nice to be able to furnish our small piece of real estate with cubicle or office accessories that make our lives a bit more organized and a bit more comfortable. 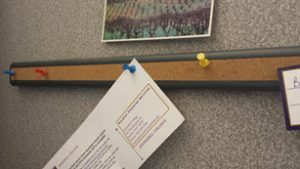 I decided to put together a list of 20 nifty small office organization ideas of items all of which I have previously featured on this website. I think having these 20 in one article will be a great resource if you are looking to organize your small office more efficiently and effectively. 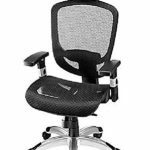 Some of these are specialized cubicle accessories since they are made to attach to a cubicle wall or over a cubicle wall but most of them can be utilized in any small office. They are in no particular order. I have owned my Post-it Desktop Organizer for years now and I pretty much use it every day. I wrote about it in more detail in this article and, since I cannot live without Post-it Notes, it is the perfect organizer for my desktop. It came with Post-it Notes and Post-it Flags and I store my scissors, pens, pencils, and paper clips in this organizer. The kicker is that it comes with a built-in tape dispenser as well! I really like the fact that in a small footprint I can store small office items that I use on a regular basis and only a few inches from my keyboard. 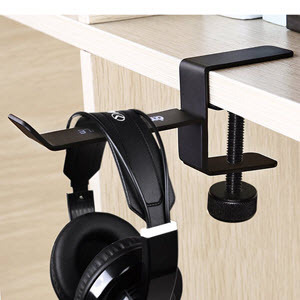 In this article I wrote about a new product called the 6AMLifeStyle Headphone Holder that I purchased for my cubicle at work and for my home office. At work I use my Panasonic Headset but at home I use my AYL BlueTooth Headphones to attend a meeting remotely. I hang both of these items on my new headphone hanger so they are always accessible. 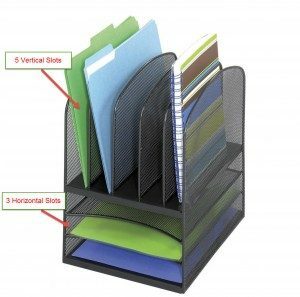 This innovative product identifies a need of the office worker and provides an organized way of storing an office item that you use on a regular basis. It's not only practical but it's stylish as well! 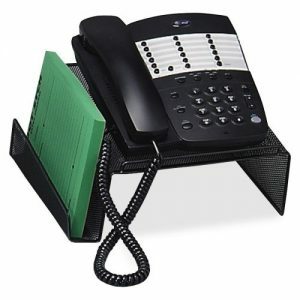 One day I saw this Sparco Mesh Phone Stand in a coworker’s office and I thought it was a great idea. When it comes to unique small office organization ideas, this phone stand is very versatile. It basically uses levels to maximize small office space and you can store items below the stand and a notepad in the side compartment. And I really love the mesh because it's not only sturdy, it's stylish as well. Many of the products here in this list, especially the shelves allow you to store items on various levels. This article goes into the Sparco Mesh Phone Stand in more detail. I love this cubicle shelf! I must admit that this small, relatively inexpensive item is one of the most popular on this site. I’ve had mine for over 3 years and it has remained rock solid on my cubicle wall. I know that I started a trend because I've seen at least 4 or 5 of these in cubicles right in my physical area of the company. This article gives many images of the shelf and shows you how to easily hang it on your wall. Just be aware that the maximum weight that is suggested to keep on it is 5 lbs which is fine because this is a great shelf for pictures of your family, business cards, or vacation souvenirs. The article I wrote on my desk shelf shows how I load it up with many different office items including books, pens, wipes, radio, and can of compressed air. You can also see that I store my box of tissues and extra coffee cups beneath it so that I can expand the limited real estate of my desktop. Small office organization ideas are very important in the limited workspace environment. Being able to store at differing levels is a huge advantage to an item like this Rolodex desk shelf. This is just another cubicle accessory that allows me to maximize the space that I have in my office. Even in this day and age we still use business cards. People ask me for mine if they are visitors or coworkers may want one just to have my contact information. 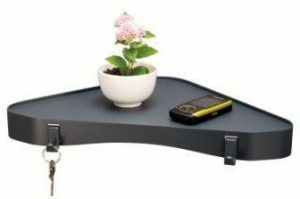 The article I wrote about this space saver includes a video of me hanging this business card holder on my office cubicle wall. 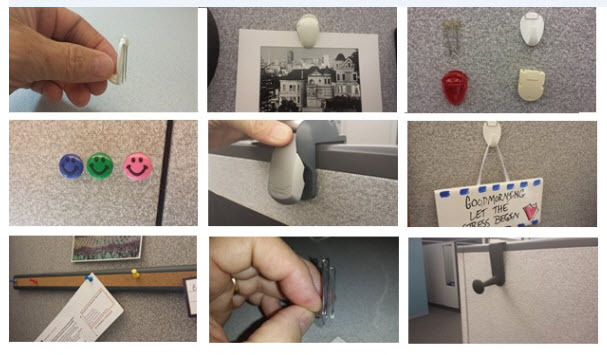 If you've perused this site at all, you know that I emphasize using cubicle wall accessories simply because it allows you to expand the real estate of your office and allows you to remove items from your desktop. 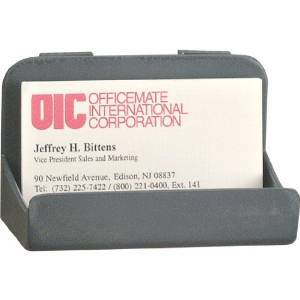 This cubicle wall business card holder is just a great example of this solution. Versatility is the best word to describe this unique office accessory. The article I wrote shows just how unique and versatile this corner organizer truly is. Not only can you place it on its end, you can also place it on its side and it works either way. If you want to use the corner of your office to store items, you should stand it on its end. 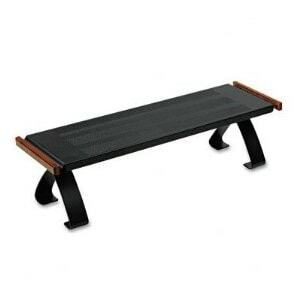 If you want to just use it as a shelf and not necessarily in the corner, you can use it on its side. Just so unique! Corners in any office are usually wasted space. When it comes to small offices, you have to take advantage of all of the space that you have available to you. And that also means the corners. The VerticalMate Hanging Corner Shelf Unit shown here and in this article, certainly makes good use of typically wasted corner space. It hangs from a cubicle wall so you can put it up and out of the way. It’s certainly one of the best small office organization ideas! 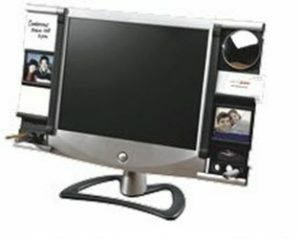 I just recently wrote an article on this Aspect Monitor Accessory Frame. It is one of my most recent purchases. This is also a way to utilize space not typically utilized in a small office. 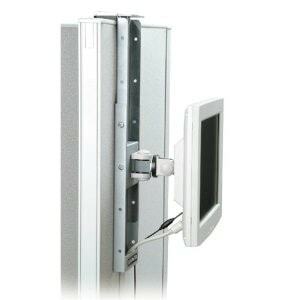 You simply mix and match the configuration that you prefer and attach the unit to the side of your flat panel monitor. 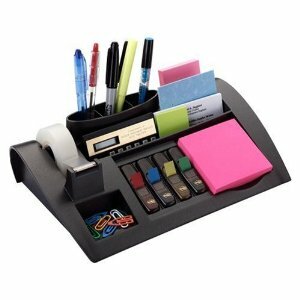 You have spots for a small white board, picture frame, Post-it Note holder, monitor mirror, business card holder, and a hidden compartment to store staples, paper clips or other small items, as well as a spot for 3 different writing utensils. 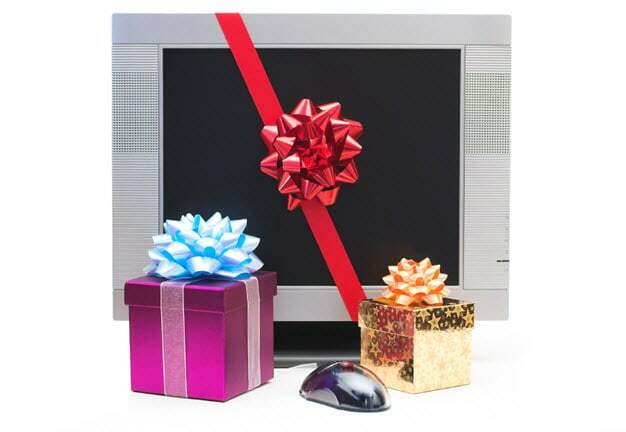 You can buy either a right or a left aspect monitor accessory frame. If you don’t have a smart phone you are probably in the minority. I purchased my Samsung 4 a little over a year ago and I really don’t know how I got by without it. 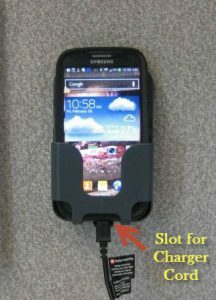 This article will show you many images of my cell phone holder and how I hung it on my cubicle wall. It is really nice to have it in clear view while it's on my cubicle wall. As you can see in the image on the left, there is a really convenient slot that I use to plug in my phone for charging.Just another way to get stuff off of your desktop and use your cubicle wall. One of the best ways to increase the space in your small office is to use the walls. This particular Fellowes Wire Paper Tray allows you to have 3 trays for your project folders, trade magazines, or important papers easily at your disposal. This article shows images of it in my office cubicle. There really is no assembly other than attaching the trays. You can then load them up with what was once cluttering up your desktop! I never really thought I’d be able to have a dry erase board office cubicle but this Officemate Magnetic Dry Erase Board allowed me to easily attach it to my cubicle wall and use it to write down my ToDo list or whatever else I want to be reminded of. 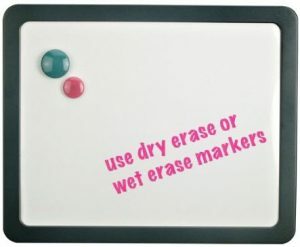 This article includes a YouTube video and the dry erase marker set that I purchased with the white board. I use it every day and it keeps all of the projects that I am working on right in my line of sight. Who needs a large office to be able to hang a dry erase board? This fits perfectly in my small office space. 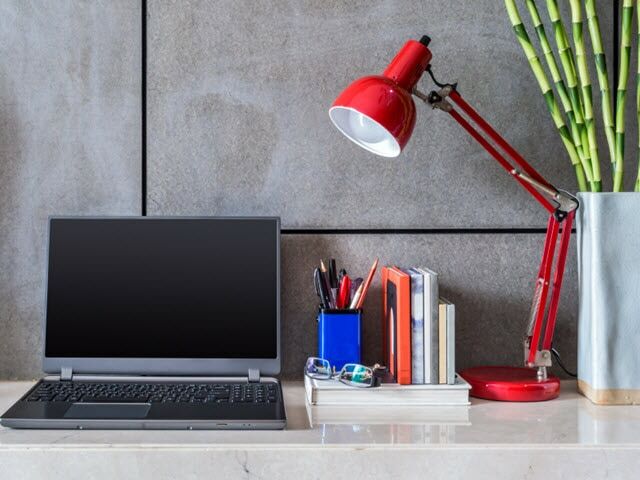 In small spaces you need to find office accessories that work for that small space. Organizing in a small space is such a challenge but I try to find items that make sense and help me stay organized. This Safco Onyx Mesh Desk Organizer is a great solution for my desktop. 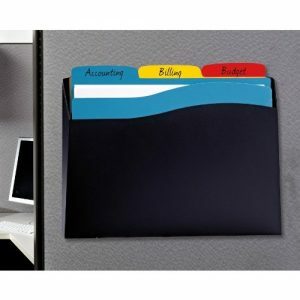 It has a vertical section to hold project file folders and a horizontal section for other important paperwork. It’s a small footprint but fills a big role in my small office. This article also includes a video. A cubicle’s configuration is usually pretty typical. In my cubicle, my head faces the corner which is where my monitor and keyboard are located. I decided a while ago to buy a Kensington Flat Panel Monitor Cubicle Hanger. I previously had my monitor on a stand but it used a lot of my corner desktop. It also was a little lower that I wanted. 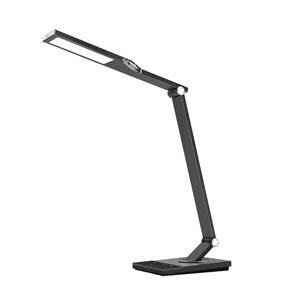 My monitor hanger which is detailed in this article has been an awesome addition to my cubicle and there are multiple heights at which you can set the monitor to suit your needs. Have you ever heard of a cork bar? I bet you haven't unless you follow this site. I found this really cool office item online and I think it really fulfills a need. 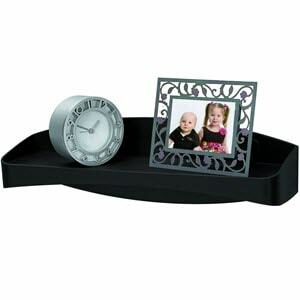 It holds messages and important notes that you may want to have at your disposal. This article gives more details and includes a video. Here’s another really cool office cubicle item that I picked up to hold my long-term goals at work. I can fit 2 – 8 1/2″ X 11″ sheets of paper side by side in this Fellowes Partition Additions Note Rail which works out perfectly for my needs. This article goes into more details about this novel cubicle accessory. The paper magically sticks to the note rail when you insert it. You can insert material up to 1/8″ thick so, in essence, it can handle multiple pieces of paper or other material if that suits your needs. 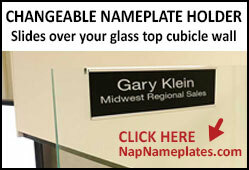 Cubicle accessories are all over the office marketplace. This Officemate Cubicle Utility Bowl is another in a long line of accessories that attach to the fabric of a cubicle wall. 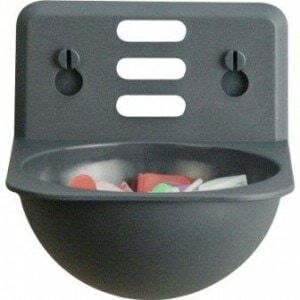 I keep small items in this bowl like binder clips and cubicle wall clips. This article will give you some more info on the product and it includes a video as well. If you want a unique office item in your cubicle for really short money, this would be a nice addition. 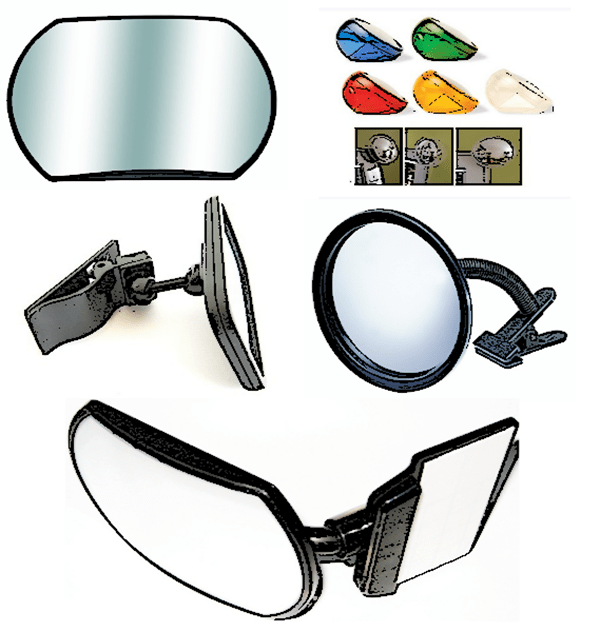 This Avery Cubicle Wall Pocket is another in a long line of specialized cubicle accessories. 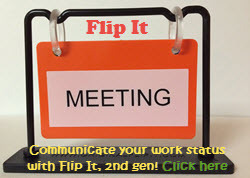 What is really cool about this unique product is that you can put it anywhere that you want on your cubicle wall since it doesn't take up a lot of room. It's perfect for project file folders that you need to access quickly. I use mine for my latest project(s) that I am working on. This article will show it in my office cubicle. 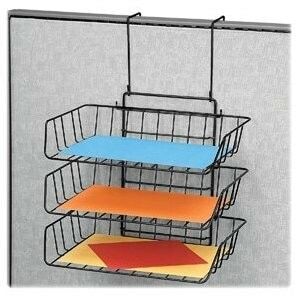 This is another reasonably-priced small office accessory which will really help you stay organized. Managing the multitude of wires which are found in any office, let alone a small office, is a challenge. 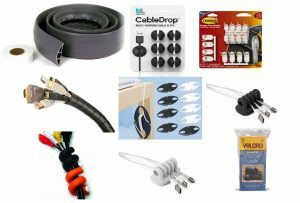 This article includes many different solutions to managing those wires including many specialized products specifically geared toward managing wires in the office. 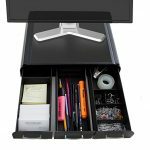 I use many of the products featured in this article and they can really help you stay organized and safe in a small office. Just scroll down in the article and you'll see many different cord management ideas featured. 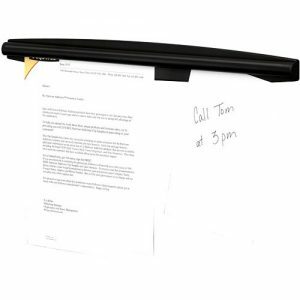 This Fellowes Letter Tray is another specialized cubicle wall accessory that attaches to the fabric of the cubicle wall with stainless steel needles. This article goes into detail with many images of it in my cubicle. It is great for storing important letters but lately I've been using it to hold my antiseptic wipes and compressed air. I hope that you enjoyed this compendium of 20 small office organization ideas. If you have any questions or comments you can leave them in the comments below or use my Contact Me form. Feel free to suggest any other products that would recommend for a small office. Great product selections! I’m always needing to better organize myself. Hey Bob, the organizational ideas that you have shared in your blog are amazing. The best thing I saw in that is a “Spar co Mesh Phone Stand” and “Kensington Flat Panel Monitor Cubical Hanger” these both are amazing. I like it. Keep posting. Hi Alyssa, I actually use the flat panel monitor hanger in my own cubicle as well as the phone stand. Thanks for your question. How are you currently handling the paper docs that are awaiting responses? Perhaps you are using letter trays? Would a product like this address your needs? I also wrote articles about wire paper trays and a hanging letter tray which might help you in this matter. I feel like i need almost half of these. Really nifty! Great list! 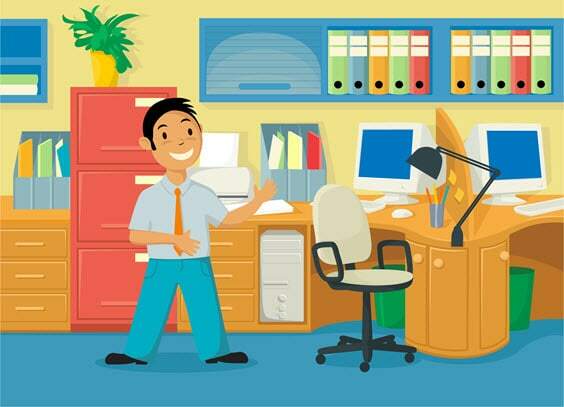 Firstly I would like to thank you for sharing your views on 20 Nifty Small Office Organization Ideas. The best thing I saw in that is a “Spar co Mesh Phone Stand” and “ Aspect Monitor Accessory Frame” these both are amazing. I like it. Keep posting. I was looking for the same blog. This blog is very informative; I will also share it with the customers that are coming to my website.